I just realized that I never posted my 2010 gardening plan, or instructions on how to create a gardening plan. Here’s the first, and the “how to” will be following in a few days. Please note, the colors on here have nothing to do with my Planting by Color schedule. I just have a tendency to color code everything! This year I’ve made the switch–all my spring veggies are on the west side of my yard. These will get full sun all day, but shade in the afternoon. I have found this makes a big difference when the temperatures rise. On the other hand (and side) I have put my tomatoes and peppers on the east side, which gets full, hot, afternoon sun. They should love the heat! My plan doesn’t show any squash, watermelons, pumpkins, etc. That’s because we STILL haven’t finished our front garden beds, and I’ll grow them there again! Last year I had low yields, but that was fine for the zucchini. And, I got enough pumpkins to carve. This year I’m going to really mix in some compost (I don’t have raised beds and Mel’s Mix there), plant them early, and do all I can to help them grow. 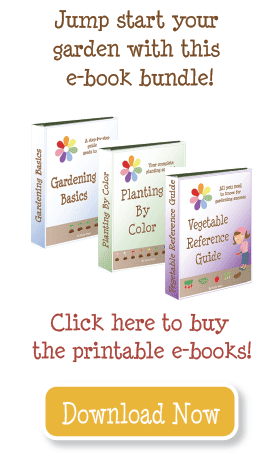 Go here for instructions on creating a square foot gardening plan. You can plant it in one square, but it will spread and take over a lot more! When I trellis mine against a nearby chain link fence it still takes up 2-4 squares each. Can you put a pumpkin plant in just one square or am I pushing it if I do that? Thanks! never thought of using Excel to make my Garden plan. Thanks for the great idea!